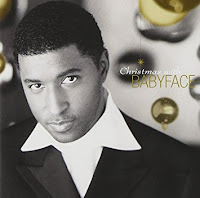 If you're looking for a smooth soul Christmas CD, the 1998 CD Christmas With Babyface might be right up your alley. It's an album of Christmas standards with Babyface's trademark style. It was his final album for Epic Records so it looks like he recorded it to fulfill contractual obligations. Babyface was very successful at the time. His 1996 album The Day was certified 2XPlatinum and Every Time I Close My Eyes was a top ten pop hit. He also won a Record of the Year Grammy for producing Eric Clapton's Change the World. Babyface and his wife Tracey Edmonds wanted to get into producing films. And they produced the 1997 film Soul Food which was very successful and was turned into a TV show. The other thing is that his long time business partner LA Reid had just started working as an executive at Arista. So Babyface wanted to leave Epic. But he had two albums remaining on his contract. The first album was MTV Unplugged in 1997 and Christmas With Babyface was the second album. With one exception, the album is Christmas standards like this cover of the 1943 Bing Crosby hit I'll Be Home For Christmas. Babyface produced the album with Mariah Carey's producer Walter Afanasieff. I'll Be Home For Christmas features background vocals by Take 6. And the guitar solo is by veteran session musician Michael Thompson. Afanasieff plays keyboards and other musicians are Nathan East on bass, Ricky Lawson on drums and Paulinho Da Costa on percussion. Babyface fans will enjoy this album. After Babyface left, Epic released a shorter version of this album in 2001 as Spirit Of Christmas. I'm not sure why they did that. Stick with the original which is available as a budget CD. Here's a video for I'll Be Home For Christmas by Babyface.